The Roman Emperor Tiberius expired at Misenum on this date in 37 A.D.
As Tiberius had been spending his last years terrifyingly purging Rome of alleged “traitors,” his death was met with some considerable relief. Great news: charismatic young prince Caligula is in charge now! Anyway, despite the old man’s unpopularity and the manifest injustice of his treason trials, Tiberius’s death did not quite halt momentum of political butchery. Ever thus with bureaucracies. The people were so glad of his death, that at the first news of it some ran about shouting, “Tiberius to the Tiber,” while others prayed to Mother Earth and the Manes to allow the dead man no abode except among the damned. Still others threatened his body with the hook and the Stairs of Mourning, especially embittered by a recent outrage, added to the memory of his former cruelty. It had been provided by decree of the senate that the execution of the condemned should in all cases be put off for ten days, and it chanced that the punishment of some fell due on the day when the news came about Tiberius. 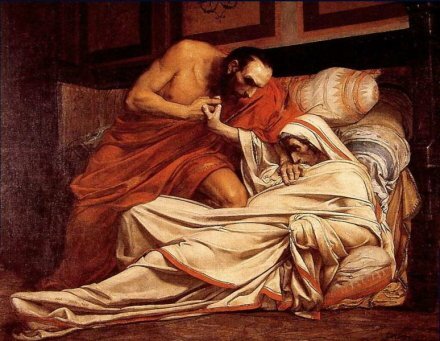 The poor wretches begged the public for protection; but since in the continued absence of Gaius [Caligula] there was no one who could be approached and appealed to, the jailers, fearing to act contrary to the law, strangled them and cast out their bodies on the Stairs of Mourning. Therefore hatred of the tyrant waxed greater, since his cruelty endured even after his death. But Tiberius’s cruelty didn’t endure too long after his death. Pretty soon, Caligula’s cruelty would have the stage all to itself and Tiberius survivors would be yearning for the good old days. The History of Rome podcast covers Tiberius’s crazy years and the transition to Caligula here. * It’s not completely explicit that it was on this same March 16 that news of the emperor’s death hit Rome; therefore, it’s conceivable that the drama described here played out on a subsequent date.